Since then, I have updated my estimates of capital services and found an error in the series I used in the blog. This error substantially overstated capital growth since 2015 and, as a result, understated the role of slower capital deepening in the second productivity puzzle (slower growth). The error does not influence interpretation of the first (lower level) productivity puzzle, nor does it affect Bank forecasts. Using the updated capital services series (chart below), slower capital deepening can explain nearly two-thirds of the growth puzzle from 2011-2016 (compared to one-half previously). 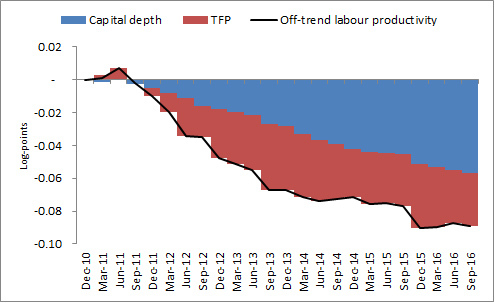 Explanations of the productivity puzzle that focus on capital-labour substitution are becoming more and more plausible. Patrick Schneider works in the Structural Economic Analysis Division. Previous Post The art of the deal: what can Nobel-winning contract theory teach us about regulating banks?